manually Trade: You open a CALL or PUT Trade (using the "CALL" or "PUT"). The EA will automatically open the trade at the broker, and possibly also the following trades with the right amount of Martingale. CopyTrades: Read signals from "CopyTradesForBinaryOption_Sender_EA"
The Expert Advisor runs on all timeframes (up to 4 Hours) and with many different expiration times! You can trade max 10 currency pairs with one EA! Simply enter in the settings and the EA will trade these currency pairs simultaneously. A detailed description can be found under "comments". Here you find a link to our current description. If you want to trade with our indicators, you have to buy this in the marketplace. Only then this EA can trade with the indicator. Or you buy the full version "My Binary Option EA Full Version". Here are all indicators included. No additional purchase necessary! For further information, please click on the indicator link above. You will see how the indicator work. Check the option "Allow WebRequests for listed URL"
You can test the EA in the strategy tester. But signals are only displayed at the place where trades would be opened. This is due to the special design of the trades for Binary Options. The results are displayed in the chart. The EA simulates the trades and shows the profit / loss. The EA now supports more MT4 Binary Option brokers. Bug solved while reading the ForexNews. EA does not stop anymore. Fixed bug when calculating balance in Strategy Tester. 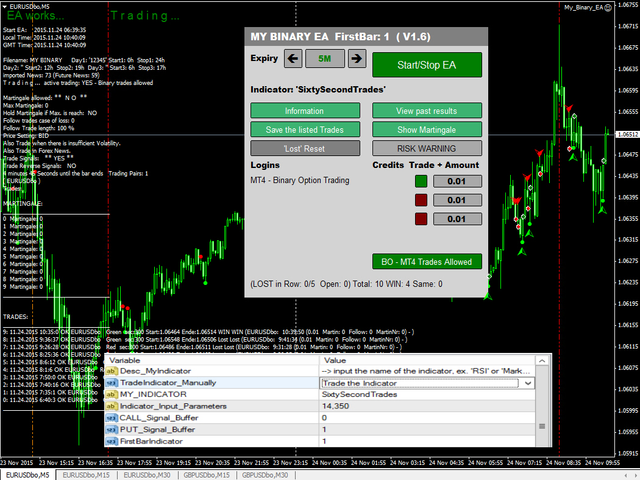 - now you can choose 'CopyTrades: Scan Global Variables'. Another EA or indicator writes global variable. This you can now read and open trades. - Update at current Forex News reading. Bug at times calculation during the change of a day. The New settings of the "BinarySHREK" indicator are supported. The EA scan the chart for an arrow from a indicator or EA. Like a CALL (Arrow code 233) oder PUT (Arrow code 234). If the "My Binary EA" found this code he will open a binary option trade. The EA scan the currently open forex trades and open directly a binary option trade with the settings of the "My Binary EA". Copy trades from the "Sender EA". The Sender EA can run on another MT4 account. 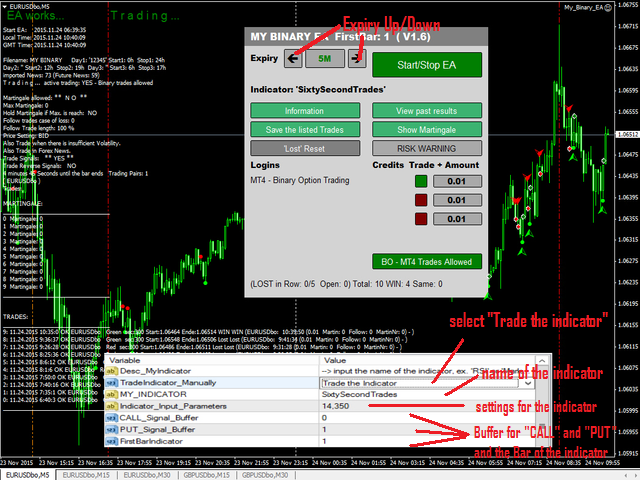 The "My Binary EA" can read the open trades on the other account via the "Sender EA" and open a binary option trade with the options that were specified in the settings. - support our indicator "MEGA BREAKOUT", "BinarySHREK", "EASYBINARY", "TradeTheHour"
The EA can read automatically our indicators. The indicators must be installed in the folder "...\MQL4\indicators" or "...\MQL4\Indicators\Market". Max Martingale Level: max martingale level or "NO Martingale". Single - 1,2,4,8,16, etc. If "LOST", it's value is the next level, if "WIN", the level is 0. Double - 1,2,2,4,4, etc. If "LOST", it's value is the next level, in case of 2 "WIN", the level is 0. Compounding - 1,2,3,4, etc. If "WIN", it's value is the next level, if "LOST", the level is 0. Martingale Amounts: own amounts like 10,20,40,50, etc. (seperated by a comma). Fixed errors in results (follow trades calculation) and new settings of the EA.